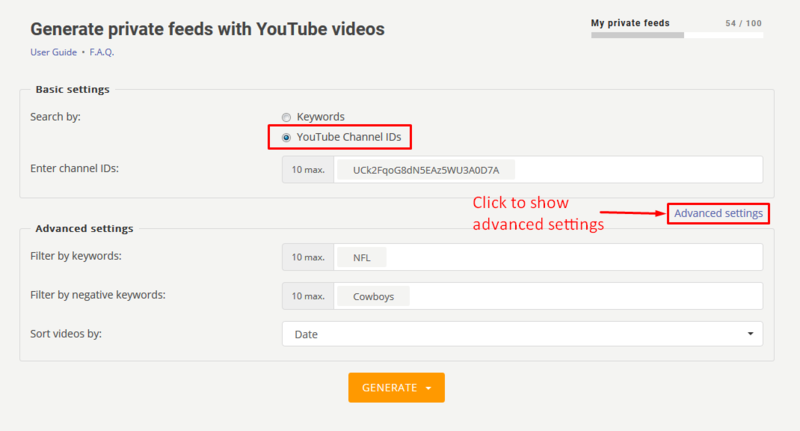 With YouTube Feeds tool you can search for targeted YouTube videos using your keywords or specific YouTube channel ID. * YouTube Feeds tool doesn't provide search by users or playlists (for now). 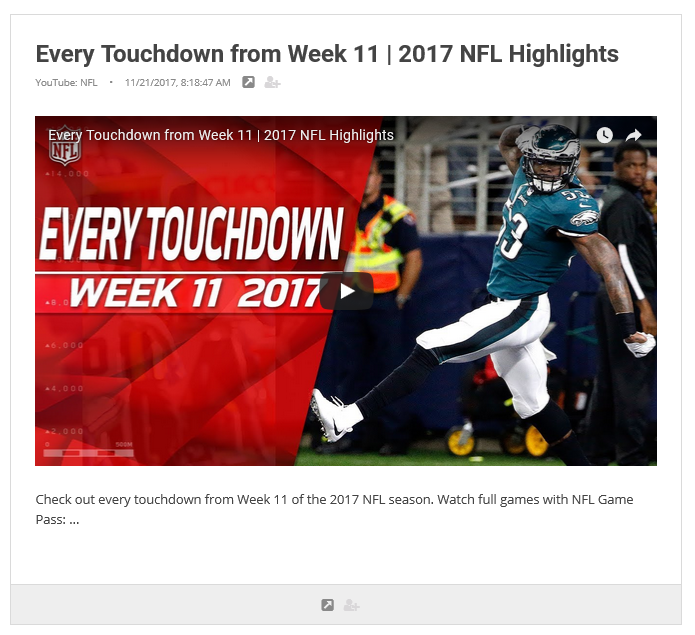 Search results will be combined into a self-updating content feed which will show all latest YouTube videos related to your search. YouTube feeds are Private content feeds. 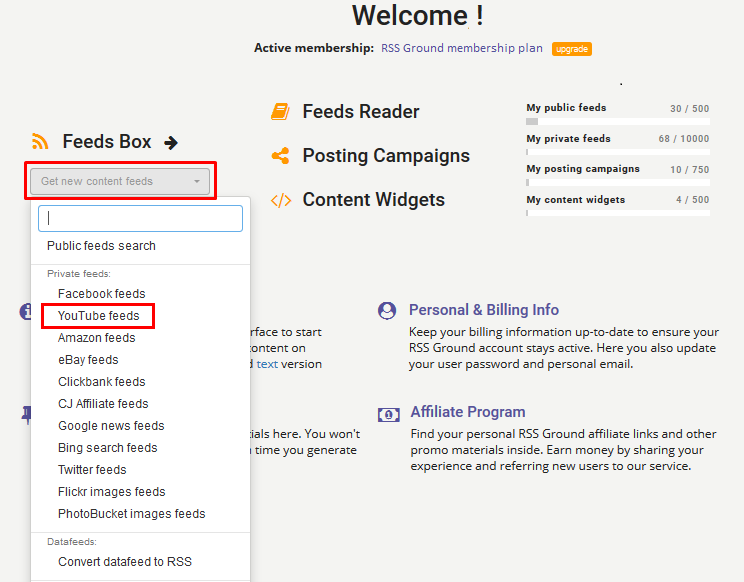 The number of active Private feeds may be a subject to limitations at minor RSS Ground membership plans. YouTube Feeds tool Basic and Advanced settings. Advanced settings are optional and used for a specialized search. At the same time, basic settings are quite enough for searching for targeted YouTube videos. Choose if you wish to search for YouTube videos by keywords or by channel IDs. Specify your search keywords or channel IDs. Up to 10 search keywords or channel IDs at a time are allowed. For a more quality search results, you can use different syntax for your search keywords. Learn more about YouTube search syntax. 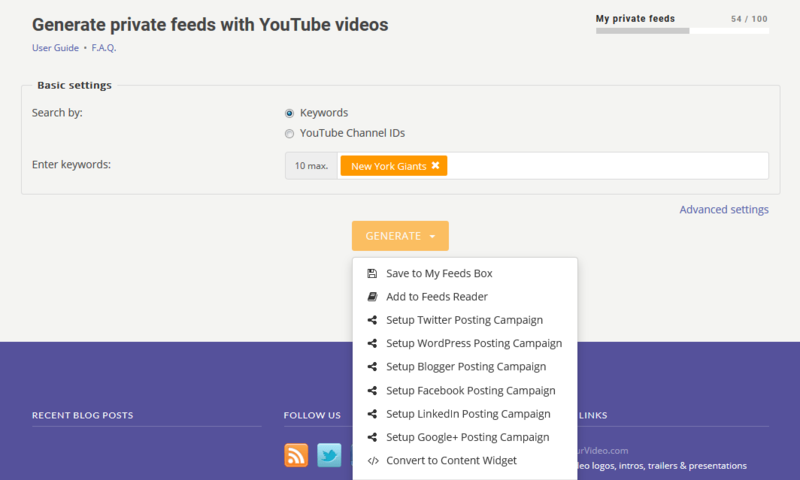 Use Setup posting campaign option to start sharing content from YouTube feeds right away. Whatever option you choose your new YouTube feeds will be saved to your Feeds Box anyway. We will generate a separate YouTube content feed for each specified search keyword or channel ID. To search for targeted YouTube videos you can use only Basic settings. Advanced mode settings are optional. However here you can use various filters to get highly targeted search results. To use advanced search settings switch Advanced mode ON. Enter your keywords (up to 10 at a time). In Advanced settings section, you use one or several filters. Filter by negative keywords - remove videos which mention in title or description specified keywords from the search result. - Date - sort videos in reverse chronological order based on the date they were created. - Relevance - sort videos based on their relevance to the search query. (not chronological order). - Rating - sort videos from highest to lowest rating. - Title - sort videos alphabetically by title (most likely first will show videos which titles start with numbers and then alphabetically). - View count - sort videos from highest to lowest number of views. - Video count - used to sort feeds of YouTube channels. In Basic settings section, you set: Search by = YouTube Channel IDs. Enter YouTube channel IDs (up to 10 at a time). Learn how to find YouTube channel ID. Filter by keywords - show only videos which mention in title or description at least one of specified keywords.